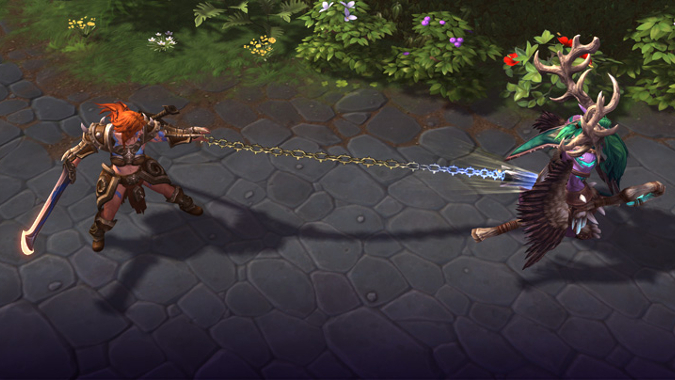 The latest Heroes of the Storm balance patch has arrived bearing nerfs to Sonya, Sgt. Hammer, Hanzo, and Sylvanas. The community expected nerfs to both Sonya and Hanzo, considering how oppressive both heroes have become. Sonya’s Poisoned Spear enabled her to lay down extreme burst damage while her Nerves of Steel talent made it too easy for her to survive punishment in turn. Both have been scaled back, with Poisoned Spear now doing less damage and Nerves of Steel protecting her from less damage. Hanzo’s damage has been slightly scaled back across the board and his Sharpened Arrowheads now only removes a maximum of 20 armor rather than 25. The Sylvanas nerfs are a little more surprising. After the changes to laning and structures in the 2018 Gameplay Update, Sylvanas’s passive ability to disable forts and towers has been perceived as more powerful than ever — empowering objectives and lane pushes to a degree beyond what she could previously achieve. In exchange for that power, Sylvanas’s ability to participate in a team fight was limited, with low damage and little to no ability to decide where she wanted her damage to go. Rather than nerfing the strength of her passive, the developers have instead nerfed her damage even further. She now has less health, lower health regen, and a longer cooldown on Shadow Dagger, her primary source of damage. Rather than changing Sylvanas’s trait — which could necessitate a full redesign of the character — the developers seem to be going all-in on it. If you play Sylvanas, you better hope your team can make the most of her disabled structures, because she’ll soon bring little else to the table. Passive energy regeneration increased from 2 to 2.5 per second. Fixed a number of inaccuracies and grammatical issues in tooltips across the game. Korean Client: Updated the loading screen to the Korean localized version. Blaze: Fixed an issue that allowed Heroes to bypass the movement speed reduction from ignited Oil Spills if Blaze chose the Adhesive Petroleum talent. Blaze: Fixed an issue causing Stimpack and Pyromania voiceover lines to be heard globally. Tyrael: Fixed an issue preventing Tyrael from gaining stacks of Ardent Restoration from the damage dealt by the Burning Halo talent. Some of the buffs we’re seeing in this patch are reversals of the nerfs doled out across all support characters back in November. Tyrande’s buff is merely giving back the damage she lost in her previous nerf, and Brightwing’s health is being scaled up closer to what it used to be. Valeera’s buffs, meanwhile, are targeting a generally underperforming character. After the stealth rework, Valeera was meant to specialize in locking down — and shutting down — her slipperiest opponents. Unfortunately, Valeera herself doesn’t have the power to manage it, and has more often than not been the one easily shut down. Whether or not these buffs will help remains to be seen.